The original Kava Blender Bottle from Kona Kava Farm. Take your Kava enjoyment to the next level with these stylish sport bottles for all things Kava. If you want a quick and easy way to blend your Instant Kava Mix without all the noise and mess of a blender, then these are a dream come true. These sturdy, BPA-free bottles are a generous 20 ounces large – that means it’s big enough for any Kava you wish to make in it, even if it’s a double! 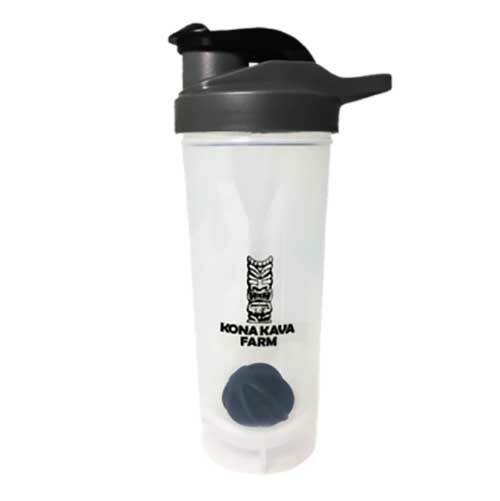 The original Kava Blender Bottle from Kona Kava Farm. Take your Kava enjoyment to the next level with these stylish sport bottles for all things Kava. Don’t deal with loud messy electric blenders when you’re trying to relax. If you want a quick and easy way to blend your Instant Kava Mix, then these are a dream come true. These sturdy, BPA-free bottles are a generous 20 ounces large. That means it’s big enough for any Kava you wish to make in it, even if it’s a double! What’s even better, is that you can easily store any extra Kava in the fridge (Not that we ever have any left!) to enjoy up to a week later. The seal is strong enough to not leak, but easy enough to open and close. Hassle free cleaning, with an indestructible blender ball that stays in the bottle and blends any Kava in a flash. This sleek blender bottle makes it easy to strain your kava too (if you’d like to) using one of our Kava Muslin Strainers, they easily pour into a strainer if you want your Kava supplement to be smooth and chalk-free. And these blender bottles aren’t just for Kava! Enjoy just about any drink as these evolved sports drink bottles are super versatile. They’ll stand up to repeated washings, they will fit into any standard size cup holder, and can be used over and over again. These bottles also make perfect gifts for both Kava lovers or anyone who needs a sports bottle during their day or for their workout.